Bu çalışmanın amacı; sınıf öğretmeni adaylarının sınıf düzeyleri açısından sayı duyusu becerilerini incelemektir. Bu araştırmada betimsel araştırma metotlarından tarama modeli kullanılmıştır. Araştırmaya bir devlet üniversitesinde sınıf öğretmenliği anabilim dalında öğrenim gören toplam 312 öğretmen adayı katılmıştır. Araştırmada veri toplama aracı olarak Kayhan Altay tarafından geliştirilen 17 soruluk sayı duyusu testi kullanılmıştır. Araştırmanın bulguları öğretmen adaylarının sınıf düzeylerine göre sayı duyusu performanslarının farklı boyutlara göre anlamlı bir şekilde farklılaştığını ortaya koymuştur. Özellikle 3 ve 4. sınıf öğretmen adaylarının sayı duyusu performanslarının 1 ve 2. sınıf seviyesindeki öğretmen adaylarına göre daha yüksek olduğu görülmüştür. Üçüncü sınıflarda okutulan “Matematik Öğretimi I ve II” derslerinin bu duruma neden olabileceği düşünülmektedir. The purpose of this study is to examine the number sense of the teacher candidates in terms of their class levels. “Survey Model” which is among descriptive research methods in this study. 312 teacher candidates participated in the study. The “Number Sense Test” which consists of 17 questions developed by Kayhan Altay has been used as the data collection tool. The findings of the study revealed that the number sense performances of the teacher candidates according to their class levels differed meaningfully according to different dimensions. It was observed that especially the number sense performances of the teacher candidates of the 3rd and 4th grades were higher when compared with the values of the teacher candidates of the 1st and 2nd grades. Taught in the third grade “Teaching Mathematics I and II” course is considered that this situation may cause. Australian Education Council (1991). A national statement on mathematics for Australian schools. Melbourne: Curriculum Corporation. Diezmann, C. M. ve English, L. D. (2001). Developing young children’s multidigit number sense. Roeper Review, 24 (1), 11–13. Harç, S. (2010). 6. Sınıf öğrencilerinin sayı duygusu kavramı açısından mevcut durumlarının anali- zi, (Yüksek lisans tezi, Marmara Üniversitesi, Eğitim Bilimleri Enstitüsü, İstanbul). http://tez2. yok.gov.tr/ adresinden edinilmiştir. Hungerford, T. W. (1994). Future elementary teachers: The neglected Constituency. The American Mathematical Monthly. 101 (1), 15-21. Işık, C. ve Kar, T. (2011). İlköğretim 6, 7 ve 8. sınıf öğrencilerinin sayı algılama ve rutin olmayan problem çözme becerilerinin incelenmesi. Ahi Evran Üniversitesi Eğitim Fakültesi Dergisi, 12 (1), 57-72. Kaminski, E. (2002). Promoting mathematical understanding: Number sense in action. Mathema- tics Education Research Journal, 14 (2), 133–149. Kayhan Altay, M. (2010). İlköğretim ikinci kademe öğrencilerinin sayı duyularının; sınıf düzeyine, cinsiyete ve sayı duyusu bileşenlerine göre incelenmesi, (Doktora tezi, Hacettepe Üniversitesi, Sosyal Bilimler Enstitüsü, Ankara). http://tez2.yok.gov.tr/ adresinden edinilmiştir. MEB (2009). İlköğretim Matematik Dersi 1–5. Sınıflar Öğretim Programı. Ankara: Milli Eğitim Basımevi. McIntosh, A. (2004). Where we are today? In A. McIntosh ve L. Sparrow (Eds. ),Beyondwritten computation(pp. 3–14). Perth, Western Australia: Mathematics, Science ve Technology Educa- tion Centre, Edith Cowan University. Menon, R. (2004). Elementary school children’s number sense. International Journal for Mathematics Teac- hing and Learning. (http://www.cimt.plymouth.ac.uk/journal/ ramamenon.pdf adresinden edinilmiştir). Mohamed, M. ve Johnny, J. (2010). Investigating number sense among students. Procedia Social and Behavioral Sciences, 8, 317-324. National Council of Teachers of Mathematics (1989). Curriculum and EvaluationStandards for School Mathematics. Reston, VA: NCTM. National Council of Teachers of Mathematics (2000). Principles and standards for school mathema- tics. Reston, VA: NCTM. National Research Council (1989). Everybody Counts. A report to the nation on the futureof mathe- matics education. Washington, DC: National Academy Press. Pike, C. D. ve Forrester, M. A. (1996). The role of number sense in children’s estimating ability. Proceedings of the Day Conference, British Society for Research into Learning Mathematics (pp. 43–48). Institute of Education, London: BSRLM. Reys, R., Reys, B., McIntosh, M., Emanuelsson, G., Johansson, B. ve Yang, D. C. (1999). Assessing number sense of students in Australia, Sweden, Taiwan, and the United States. School Science and Mathematics, 99, 61-70. Siegler, R. S. ve Booth, J. L. (2005). Development of numerical estimation: A review. In J.I. D. Camp- bell (Ed. ), Handbook of mathematical cognition(pp. 197–212). New York: Psychology Press. Singh, P. (2009). An assessment of number sense among secondary school students. International Journal for Mathematics Teaching and Learning. Oct 2009, 1 – 29, (ISSN 1473 – 0111). (http:// www.cimt.plymouth.ac.uk/ journal/singh.pdf’den edinilmiştir). Tsao, Y. L. (2005). The number sense of preservice elementary school teachers. College Student Journal, 39, 647-679. Verschaffel, L., Greer, B. ve De Corte, E. (2007). Whole number concepts and operations.In F. Lester, Jr. (Ed. ), Second handbook of research on mathematics teaching and learning (pp. 557– 628). Charlotte, NC: Information Age Publishing. Yang, D. C. ve Reys, R. E. (2001). Developing number sense. Mathematics Teaching, 176, 39–41. Yang, D. C. (2002). Teaching and learning number sense: One successful processoriented activity with sixth grade students in Taiwan. School Science and Mathematics, 102 (4), 152–157. Yang, D. C. (2003). Developing number sense through realistic settings. Australian Primary Mathe- matics Classroom, 8 (3), 12–17. Yang, D. C. (2005). Number sense strategies used by 6th-grade students in Taiwan. Educational Studies, 31, 317-333. Yang, D. C. (2007). Investigating the strategies used by preservice teachers in Taiwan when respon- ding to number sense questions. School Science and Mathematics, 107, 293-301. Yang, D. C., Reys, R. E., ve Reys, B. J. (2009). Number sense strategies used by preservice teachers in Taiwan. International Journal of Science and Mathematics Education, 7, 383-403. Zaslavsky, C. (2001). Developing number sense: What can other cultures tell us?. Teaching Child- ren Mathematics, 7 (6), 312–319. ISNAD YAMAN, Hakan . "SINIF DÜZEYLERİNE GÖRE ÖĞRETMEN ADAYLARININ SAYI DUYUSU PERFORMANSLARI". 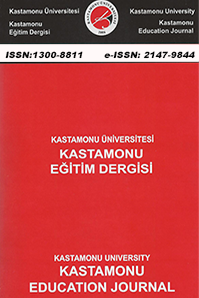 Kastamonu Eğitim Dergisi 23 / 2 (May 2015): 739-754.